Does your imaginative, computer-proficient daughter tune out in the classroom? Does your spirited son become headstrong and aggressive when faced with the simplest decisions? Does your bold, energetic child have trouble focusing on basic tasks? Millions of children--one in five--have what psychologist Lucy Jo Palladino, Ph.D., calls the Edison trait: dazzling intelligence, an active imagination, a free-spirited approach to life, and the ability to drive everyone around them crazy. Named after Thomas Edison--who flunked out of school only to harness his talents and give the world some of its finest inventions--the Edison trait is on the rise in our younger generation. - The connection between the Edison trait and A.D.D. Lucy Jo Palladino, PhD, has been a practicing psychologist for over thirty-five years. Her expertise is the study of attention. "Parents and educators alike will find this compelling reading." "BRILLIANT . . . ONE OF THE MOST IMPORTANT BOOKS IN THIS FIELD . 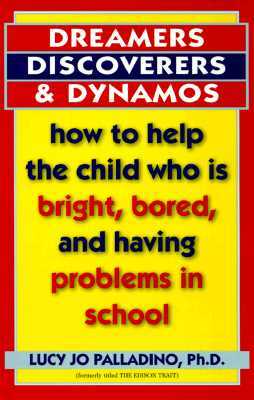 . . Parents will find in Dreamers, Discoverers, and Dynamos real-world solutions and the light of hope; professionals will discover a thought-provoking new view of these exceptional children."